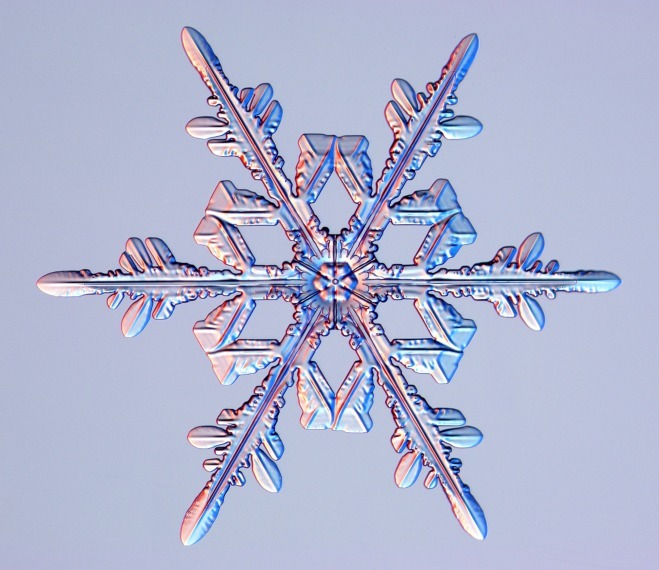 The distinctive pattern of a snowflake is an emergent property in which relation to temperature, humidity, and pressure results in novel configurations of water. Water has qualities that are not present in hydrogen or oxygen. A living cell has qualities that are not present in molecular interactions. A human being is able to respond and act in ways that are different from those of constituent cells. Emergence is central to naturalistic ways of understanding how the cosmos and life on Earth came to be. In contrast to a top-down view that all was created by a designer (God), emergence offers a bottom-up explanation for how complexity can arise from simpler forms; where natural entities – each acting in accordance with its nature – interact in ways that have result in novel entities and capabilities. This occurred in the realm of physics where, after the Big Bang, particles interacted in ways that formed atoms. From this, over time, the realms of chemistry and biology emerged – as atoms combined as molecules, and then as molecules took form as cells and multicellular forms of life. After life was present, animal intelligence and human consciousness emerged – each as something fundamentally different and more than the activity of nerve cells in brains. At each level of complexity, an atom still acts as an atom, a molecule still acts as the molecule, and a cell still acts as a cell. But, when these form in particular configurations, novel forms and qualities may emerge. Matter, in varied conditions and combinations, is seen as having potential to configure as novel things. And as these novel things then interact with their environment, further types of novel things become possible. As Philip Clayton put it, “ . . . the nature of the world is such that it produces, and perhaps must produce, continually more complex realities in a process of ongoing creativity”. Emergence can be seen in the self-formation of sand dunes, hurricanes, language, cities, the internet, and online social networks. And, as new entities continue to interact in ways that cannot be predicted, it seems likely that emergence will be part of a future in which the natural potential of matter will continue to create phenomena that cannot, now, be imagined. A Guide to Thinking About Emergence. Loyal Rue. Zygon 2007; Volume 42(4): pages 829-835. The Sacred Emergence of Nature. Ursula Goodenough and Terrance W. Deacon. In The Oxford Handbook of Religion and Science. Oxford University Press. 2008. Beyond Reductionism – Reinventing the Sacred. Stuart Kauffman. The Edge. 2006.